As a global financial centre with a growing strategic interest in sustainable finance, and a country recognized as a leader in digital technologies and innovation, Switzerland is seeking an improved understanding of how digital finance can accelerate the greening of financial flows. This implies the integration of environmental risks and opportunities into day-to-day financing and investment decisions, as well as the development of financial services and products that make a substantial contribution to environmental objectives. It also involves the use of policy approaches that harness green digital finance applications to realign financial flows towards low-carbon and resource-efficient economies. 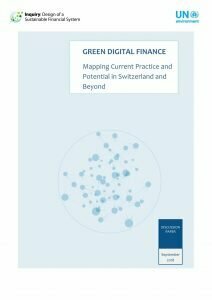 To help improve understanding of what it would take to reach such an ideal state, UN Environment, with support from the Swiss Federal Office for the Environment (FOEN), undertook a stocktaking to map emerging green digital finance practices in Switzerland and globally in 2018. The paper provides options for a number of national and international actions that could be taken forward by different stakeholder groups – governments and regulators, market actors, academic and research institutions – to better leverage the potential of digital finance to scale up green financial flows.